The title of this blog is perhaps too ambitious. How to balance an experience that still didn’t come to its end? Which kind of balance could we do? A professional balance? A personal balance? Can we clearly separate professional and personal when the “live in group” often merges with the “working group”? My colleagues have written several blogs on our installation in Burundi, the beginning of our mission and its many challenges, the implementation of our activities, our partners, the concept of “open-source” of which the project EUROSHA is inspired. … Where are we today concerning all this? Consolidate past activities and plan future activities. Three weeks. This is the time we have to organize our latest training, close our activities, establishing the best approaches to capitalize our experience and provide the provisional results of the project EUROSHA with our partners. If the coming weeks are going to be rather loaded, we couldn’t say the previous weeks were less … While organizing the last trainings with the Scouts Association of Burundi, the Girl Guides Association of Burundi, the Youth Association for the Democratization of IT, the National University of Burundi, new training sessions were implemented with the Ministry of Agriculture and Livestock and the Burundi Red Cross. 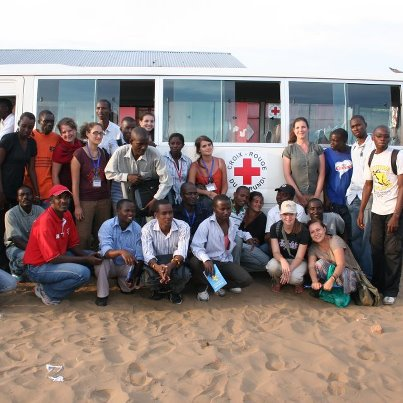 Field mapping in Gatumba with the Red Cross volunteers and the EUROSHA Kenya team. Live and work in the community: project particularity, special experience? A first experience of volunteering abroad is often a rich experience in all the senses, including unavoidably several questions. A First experience of volunteering abroad in which your home is also your office and your roommates are also your confidants, your weekend companions and of course your colleagues makes you really reflect a lot … Living and working together catalyzes many things. Working in a team is already a challenge on itself. The things become even more complicated when there are moments of personal and professional doubt, fatigue, work overwhelming, lack of clear boundaries between personal and professional life … The Christmas holidays spent in Tanzania, have allowed us to define better our mission and to better delineate professional and personal sphere. I believe that the cohesion within the team finally has its reasons. The end of the mission approaches with the feeling of leaving too early. Discover Bujumbura and starting to feel good took me more than half of the mission. On a professional level, a 6 month field mission is a real challenge to successfully implement a project well. On a personal level, it is an experience full of questioning, discoveries, meaningful encounters…but the end comes too soon.